VMware NSX delivers a completely new operational model for networking that effectively integrates data center resources for far greater agility and efficiency. Similar to virtual machines for compute, virtual networks are programmatically provisioned and managed independent of underlying hardware. Like a virtual machine is a software container which presents logical CPU, memory and storage to an application, a virtual network is a software container that presents logical network components to connected workloads - logical switches, routers, firewalls, load balancers, VPNs, and more. Network virtualization works as an overlay above any physical network hardware and works with any server hypervisor platform. The only requirement from a physical network is that it provide IP transport. There is no dependence on the underlying hardware or hypervisor. NSX Gateway allows legacy VLANs and physical hosts to be mapped into virtual networks. 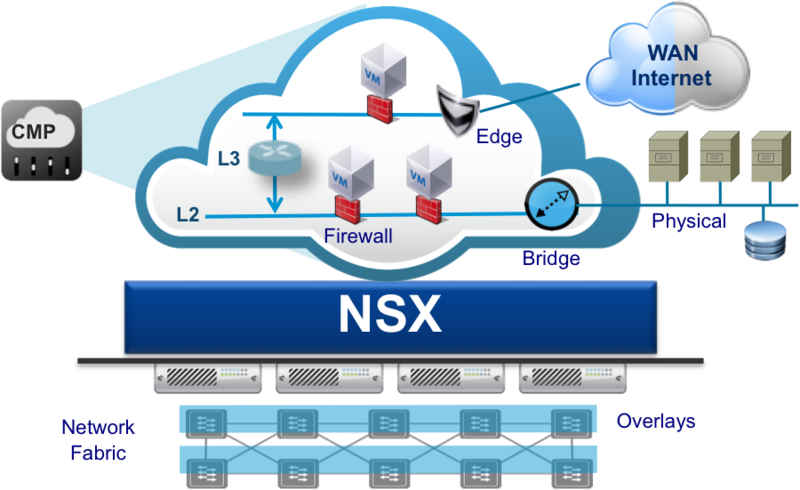 NSX reproduces the entire networking environment, L2, L3, L4-L7 network services, in software within each virtual network. NSX offers a distributed logical architecture for L2-7 services including, logical switch, router, firewall, load balancer and VPN. These logical network services are provisioned programmatically when virtual machines are deployed and move with virtual machines. Existing applications operate un-modified and see no difference between a virtual network and a physical network connection. NSX exposes a RESTful API, allowing cloud management platforms to automate the delivery of network services. Network provisioning, which used to take days or weeks, now takes seconds. Because network services are now delivered to applications by the virtual network, no manual reconfiguration of physical network devices is necessary. NSX Service Composer offers a way to automate the consumption of services and their mapping to virtual machines using logical policy. Customers can assign policies to groups of virtual machines and as more virtual machines are added to the group, the policy is automatically applied to the virtual machine. Customers can build advanced workflows automating security, compliance and network provisioning including load balancing and firewall rules. NSX offers a platform to insert other vendor services. Integrated software and hardware partner products can range from network gateway services, application delivery services, and network security platforms to security services. Fill out the form below or call 800-817-1504 Fill out the form below to start a conversation with a VLCM Representative about Network Virtualization in your environment.